Added 28.4.2013. New material added 21.5.2013, 19.2.2014, 14,11.2018. John Tenniel: Queen Victoria and Prince Albert visiting soldiers wounded in the Crimean War, at Brompton Hospital, Chatham. Coloured lithograph by J.A. Verner, 1855. 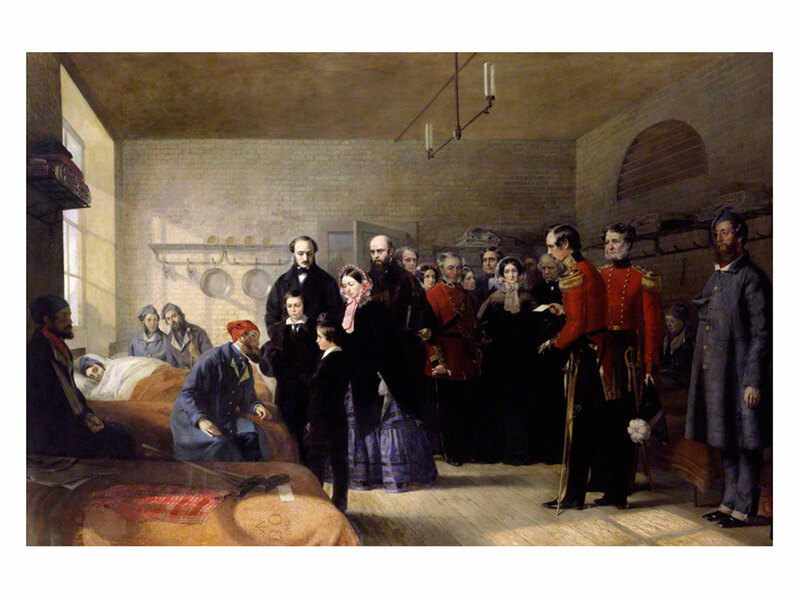 On the 5th of March 1993 a picture of the scene at the hospital painted by Jerry Barrett (1824-1906) entitled "Queen Victoria's First Visit to her Wounded Soldiers", measuring 58 by 86 inches, was bought by the National Portrait Gallery for the sum of £199,500. 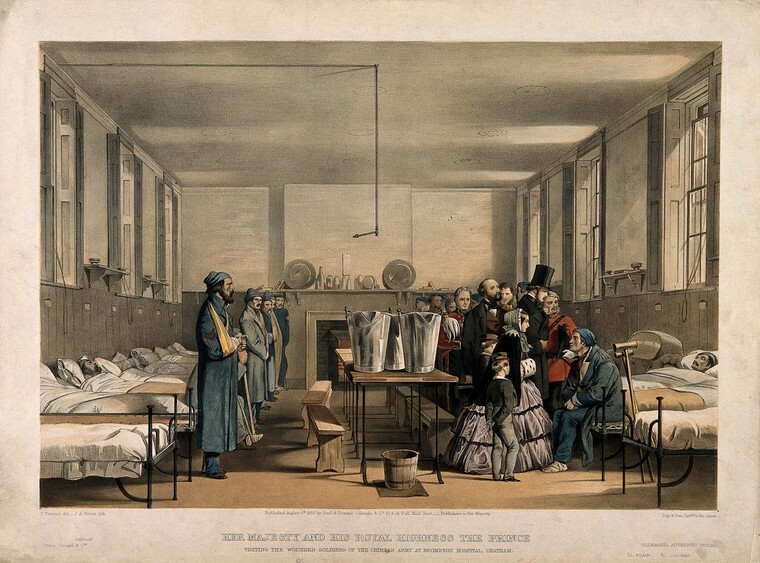 Another picture by him, "The Mission of Mercy: Florence Nightingale receiving the Wounded at Scutari, 1857", was sold to the NPG at the same time for £188,500. Pictures of both appeared in Country Life on the 22nd of April 1993. The write-up in the Christie's auction catalogue of the time states that the whereabouts of both paintings were unknown until 1959 when they were purchased by a firm of art dealers from a castle in Wales, the property of Sir Geoffrey Bates, 5th Bt. MC. The original painting of the scene at Brompton Barracks was bought by Thomas Agnew in 1856 for £430 (including the copyright) and sold to the 1st Baronet, Sir Edward Bates of Gyrn Castle, Llanasa, Holywell, Co. Flintshire in 1859 for £525, since when both had been passed down by descent. There are said to be smaller versions, as well as the sketches and studies in the Royal Collection at Windsor Castle and at the NPG. The background of the artist remains obscure, his paintings being relatively rare. There is some detailed information about Queen Victoria's visits to the Brompton Hospital at http://www.bromptonhistory.org.uk/memories/archive/queen-victoria-visits-brompton (accessed 21.5.2013). There is a copy here . Signed and dated in lower left-hand corner: 'Jerry Barrett 1856'. and inscr. in chalk on bottom stretcher bar: 'MN 364 VIC'. William Agnew, a Manchester art dealer and print publisher, also banked on the long-term appeal of the subject. He bought the painting and its copyright for £420, at some date after 26 March 1856. By June he had engaged Thomas Oldham Barlow to engrave it 'in the highest style of art', a large plate to be available to subscribers only. At the same time he paid Barrett's travel expenses to Crimea, supportive of the artist's plan to make a pendant to the Chatham image. This work was to be centred around the legendary 'angel of mercy': see The Mission of Mercy: Florence Nightingale receiving the Wounded at Scutari, 1857 (NPG 6202). As the publisher behind Roger Fenton's Crimean photographs of 1855, the Manchester dealer had built a reputation around such imagery. In May 1858 Agnew's exhibited Barrett's two Crimean paintings, NPG 6203 and NPG 6202, at Hayward and Leggatt in the City of London, to attract yet more subscribers for the prints. NPG 6203, hung alongside the bright and freely painted NPG 6202, now looked a shade dull. The figure of the Queen, wearing the 'ordinary out-of-door habiliaments [sic] of an English gentlewoman' of 1855,  appeared homely by comparison with Nightingale in her exotic setting, though such disparities were evened out in the process of print production. Reviewing the 1858 exhibition, the Athenaeum praised the 'care and quiet earnestness' of Barrett's portrait of the Queen, noting that '[a] painter of panoramic and occasional newspaper subjects is much to be pitied. His fame is bright and transient as the light of a Cremorne rocket'. Overall, the opinion was that Barrett's Pre-Raphaelite eye for truthful detail (see the Huntley & Palmer biscuit tin, copy of the Illustrated London News, regulation blankets and blue coats, etc. ), and respect for decorum, well equipped him to be a painter of contemporary history. M.P. Lalumia writes that Barlow was paid £425 to engrave NPG 6203, and gives Agnew's scale of prices for the edition; it comprised 'three hundred artist's proofs selling at ten guineas, two hundred proofs before letters at seven guineas, five hundred proofs with the letterpress title at five guineas, and an unspecified number of "prints" - struck after the first one thousand copies - at three guineas each'. In other words, even the cheapest impression was expensive. Publishing fine art prints had been Agnew's aim in acquiring Barrett's Crimean paintings; and, with public sentiment still running high, stoked by publication of the 1858 Royal Commission and other reports, the subject continued to signify. The dealer's long-term backing of Barrett was repaid. As for Barrett the 1858 prints made his name, though apparently none of his later work came near to matching this success. NPG 6203 and NPG 6202 were eventually sold by Agnew's to a Liverpool shipbuilder, Sir Edward Bates, 1st Bt, of Gryn Castle, near Holywell, Wales, in 1859. The paintings then dropped from public view  until put up for sale by the Bates family at Christie's on 5 March 1993, lots 108 and 107 respectively. The National Army Museum, London, showed early interest in the Chatham scene but withdrew after ascertaining that the National Portrait Gallery was working to acquire the pair. Queen Victoria's First Visit was estimated at £80,000 - £120,000, less than The Mission of Mercy; yet on the day of the sale it went for more, at £180,000 (or £202,912.50, including buyers' premium and VAT on the premium). Generous grants of £50,000 from the National Heritage Memorial Fund (NHMF) and £22,550 from the National Art Collections Fund (NACF) for Queen Victoria's First Visit alone helped the Gallery triumph in its acquisition campaign; see NPG 6202 for further details. 1) Court circular, unidentified publication, 5 Mar. 1855 (cutting NPG RP 6203). There were two military hospitals at Chatham: the main one at Fort Pitt, and a temporary one set up in the Brompton Barracks to accommodate the large numbers of invalids from Crimea; see 'Queen Victoria visits Brompton', Brompton website. 2) Queen Victoria's Journals, vol.39, p.143, RA VIC/MAIN/QVJ (W) 3 Mar. 1855 (Princess Beatrice's copies). 4) Manchester Guardian, 1856, no further details; cutting, NPG Archive, Scrapbook relating to Queen Victoria's First Visit to her Wounded Soldiers, NPG46/63/2/1/1. 5) Jerry Barrett lived in Brighton in 1851, and at 45 Gower Street, London, from 1854 - 9. 9) The Sun, in June 1856, reported that it was 'a plate which it is intended to be destroyed immediately after the subscribers shall have been supplied with their respective copies'; cutting, NPG Archive, Scrapbook relating to Queen Victoria's First Visit to her Wounded Soldiers, NPG46/63/2/1/1. 10) For Agnew's paying Barrett's expenses to Scutari, see Christie's, 31 May 2012 (83). 11) Sun, June 1856; cutting, NPG Archive, Scrapbook relating to Queen Victoria's First Visit to her Wounded Soldiers, NPG46/63/2/1/1. 15) Athenaeum, 28 June 1856, p.816. Breese was wounded in the campaigns of Alma, Balaclava and Inkerman. The Sun reported him standing to attention beside Barrett's painting, 'a living testimony of the accuracy of this notable work of art as the production of an historical portrait-painter' (Sun, June 1856; cutting, NPG Archive, Scrapbook relating to Queen Victoria's First Visit to her Wounded Soldiers, NPG46/63/2/1/1). 16) Wood engr. by unidentified artist, 'Her Majesty at Brompton Hospital', publ. Pen and Pencil, 10 Mar. 1855; repr. Keller 2001, p.185, fig.152. 17) Lalumia 1984, p.86, states the engraving of Queen Victoria's First Visit was published 21 Apr. 1858. But the Art Journal in May 1858, p.191, reported work in progress only: 'considerable advance has been made with these really national engravings'. 18) Manchester Guardian, 1856, no further details; cutting, NPG Archive, Scrapbook relating to Queen Victoria's First Visit to her Wounded Soldiers, NPG46/63/2/1/1. 21) Sketch in folder with letters from Jerry Barrett to Henry Newman, Henry Newman Papers, Temp. MSS 1005/16, Friends' House L., London. This may be a sketch by Barrett of the finished painting. 22) 'At Chatham he sketched the affecting incident as it took place' (AJ, May 1858, vol.21, p.191). 23) 'On the 8th [July 1856 Nightingale] came to our studio, saw the picture, was pleased with it, took an interest in the sketch of the Queen's visit to Chatham'; see [Newman] 1910, p.543. 25) Letter from J. Barrett to T. Agnew, 16 Jan. 1860, NPG Archive, Scrapbook relating to Queen Victoria's First Visit to her Wounded Soldiers, NPG46/63/2/1/1. The replica was placed in the Princesses' Corridor at Buckingham Palace, but removed to St James's Palace in 1901, and is now untraced (information from Christie's, 5 Mar. 1993 (108)). 26) For another reference to early ownership of NPG 6203 and NPG 6202 (or of copies), see document titled 'Pictures A/c', a list of picture transactions, March - October (no year, no further details), which indicates that 'Agnew per Williams' acquired Jerry Barrett's two Crimean paintings on 31 Mar. for £400 the pair; NPG RP 6203. 27) For most of the twentieth century Barrett's paintings were 'inaccessible in a private collection' (Lalumia 1984, p.84), and until 1993 known only through black-and-white photographs; see Wood 1976, p.26, fig.14, and p.230, fig.243; and Lalumia 1984, pls 38 and 39. 28) NPG 6203 is overall about 10mm larger than NPG 6202, in both width and height; and the frames' decorative friezes differ, with flower and foliage mouldings on the frame of NPG 6203, and acorns and oak leaves on that of NPG 6202. T.P.N. [Newman, T.P., ed. ], 'Letters from Scutari', Friends' Quarterly Examiner, vol.XLIV, 1910. Thomas Agnew & Sons, 1856; Sir Edward Bates, 1st Bt 1859, thence by descent; Christie's, 5 March 1993 (108); purchased by Hazlitt, Gooden & Fox Ltd on behalf of the National Portrait Gallery, with help from the National Heritage Memorial Fund and the Art Fund, March 1993. Fine Victorian Pictures, Drawings and Watercolours, exh. cat., Christie's, 1993, p.79. Maas, J., 'Two Paintings by Jerry Barrett', NACF Annual Review 1993, p.19. NPG Triennial Report 1990 - 1993, 1993, p.32. [PB: The figure wearing the blue coat and red hat sitting on his bed on the left of the picture, speaking to the young princes, is 648 Sergeant Edwin Leaney, 13th Light Dragoons. True Stories, cover and title page.